If you want a seriously good gaming display, arguably there’s only one brand to consider – Asus. For the last couple of years their displays have delivered the best gaming performance, with beautiful color quality, high speed refresh rates and most come equipped with G-Sync. There’s just one small hitch – these displays are generally bloody expensive. As one of the most affordable gaming displays Asus has ever released, the MG248 aims to change that perception. And it manages to do so too, and even better: it does it without cutting too many corners. It might be around twice the price of the most basic 24-inch displays, but basic this display most definitely is not. The 1 ms grey to grey timing means there’s nary a sign of motion blur, while the top refresh rate of 144MHz will satisfy the hungriest of frame rate hogs. Unfortunately there’s no G-Sync, but that’s to be expected at this price point as it usually adds around to the cost of a display. The native resolution is 1920 x 1080, and at this size you can just make out the pixel structure if you put your nose to the screen; at normal gaming distance it’s invisible. It’s a TN panel, yet surprisingly the field of view seems nice and wide – we noticed very little color shift even at angles of up to 45 degrees. In terms of aesthetics, Asus has gone for a matte black overall color scheme, with a hint of red around the angular base, fitting in well with its ROG products in general. It’s highly adjustable, and the screen can also be run in portrait mode if you so desire. The screen finish is also matte, thank god, which means it won’t turn into a giant mirror under bright conditions. Color and contrast quality is excellent, but it’s the brightness that really leaps out – in default mode this thing beams out more photons than a lighthouse. Six different image modes allow you to choose the best for your chosen genre, but we’d recommend a basic display calibration to get truly accurate colors and contrast, which will mean bumping down the brightness just a touch. One particularly interesting feature is the Ultra-Low Blue Light filter – many monitors have a slight blue shift in their color curve thanks to the backlight, but this feature removes this entirely. This blue light has also been proven to cause eye fatigue over time, so the removal of it means you can use this display comfortably all day without getting tired eyes. Connectivity is provided via Dual Link DVI-I, DisplayPort 1.2 and HDM11.4. There’s no support for HDR, but again at this price point that’s a forgivable oversight for a monitor in this price range. 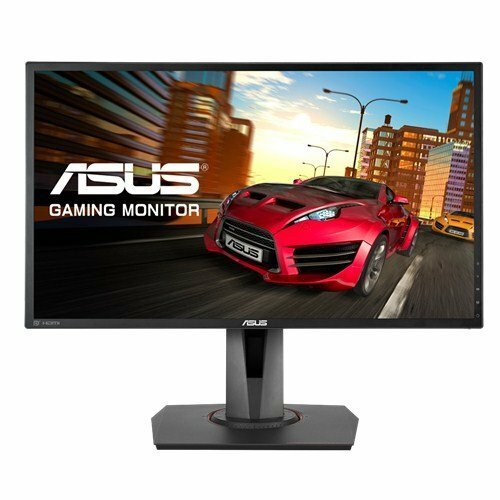 As one of the most affordable displays in the generally rather pricey Asus lineup, the MG248Q is the perfect display for serious gamers who don’t have serious amounts of cash just lying around. With crisp, vibrant image quality and a lightning fast refresh rate, this little baby’s our new favorite gaming display. Asus has successfully delivered a high quality gaming display that doesn’t carry a huge price tag with it. Excellent value overall. Asus has successfully delivered a high quality gaming display that doesn't carry a huge price tag with it. Excellent value overall.